One day my father was called to make an appraisal for furniture and other pieces of art and as usual, I joined him. We arrived at a wonderful but faded Louis XVI style castle from the late 18th Century. As we entered the yard we were told that the client hadn’t arrived yet, which gave my father and me time to admire the wonderful small castle and two very nice period stone barns. The barns were closed by very heavy wooden doors. I did just what you expected me to do, I opened one of the doors to see what was hidden inside. 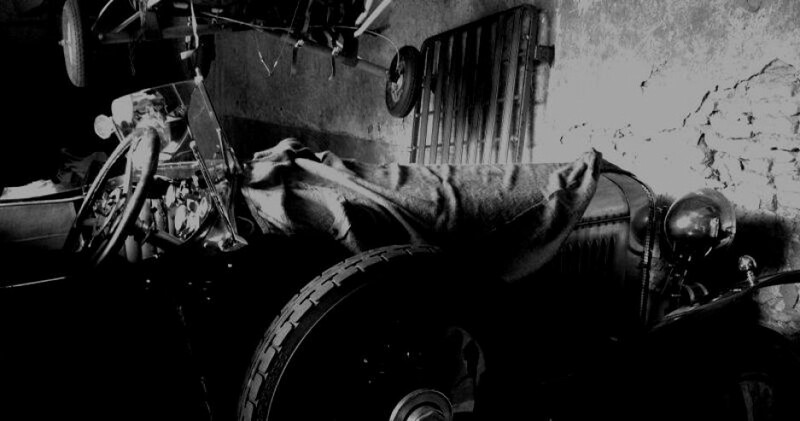 As I looked into the dark barn, I saw a dusty and dirty car frame hanging on the wall. This frame looked familiar to me and I decided to inspect it more closely. My initial thought was that it looked very much like a Bugatti frame. My heart was beating so loudly that surely anyone standing within a kilometer distance would have noticed. This is too good to be true, I thought. It can’t be anything else but a Molsheim product. While looking at it, I noticed that this chassis was very well constructed, with the thick and very long steel rails neatly bolted together and the welding was perfect. It was radiating quality and it definitely had to be something special, something made by a magical hand. On the rear suspension mounts I saw, under a thick black layer, the traditional two rounded ornamental medals stamped “Etorre Bugatti Molsheim”, see below. I wasn’t dreaming, I was actually standing next to the holy grail of any car enthusiast, a genuine Bugatti frame. I had been dreaming for such a moment for so long (10 years when you are 17 is a ling time, trust me). I had become the subject of a true fairy tale, the magical signature from Molsheim put me in a trance. I called my father, “Please come quick, we’ve got it, the dream has come true”. My father entered the barn and stood speechless in front of this sculpture, uttering “It is so well made, the work is amazing!” “For sure it’s a Bugatti”, I answered. We couldn’t believe our eyes. After a while my father told me “I see where this is going, but really I don’t want to buy a dismantled frame, even if it is from a Bugatti”. For me there had to be a reason for this frame to be in this castle, it was intended for me I thought (I was a dreamer then). Of course I tried to convince my dad that we had to buy this piece of art. As we were discussing, or rather arguing about the opportunity to buy this jewel, the owner arrived. “Oh you are admiring my Bugatti, I have just started its restoration”. When I heard these words, my dream abruptly ended and my barn find suddenly switched to a rather nice meeting between Bugatti enthusiasts instead of an unexpected discovery. I asked the man: “Which type is this frame from?”, he replied “It is from a Type 57, one fitted with an Atalante body”. An Atalante, my favorite Bugatti, the perfect example of Jean Bugatti’s magical styling genius, a magnificent body that combined so well with Bugatti’s unique approach to technical solutions. I am sure most of you will agree with that.